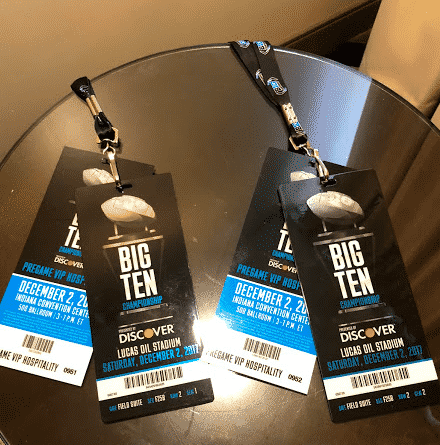 Two Free Tickets to the Big Ten Championship just for being a former SoFi customer! Since I went to Wisconsin for college, I had to take advantage of this opportunity to see my alma mater play. And so, without thinking too much about it, I looked at my calendar to see if that weekend was clear, quickly messaged my buddy to see if he was down to go to the game, and then snagged two free tickets for myself. (SoFi has a limited number of seats for each of its events, so I didn’t want to risk missing out). With a little bit of travel hacking, I was able to snag a room at the Hyatt Regency right next to the stadium using 16,000 Chase points. I then found a $40 flight from Minneapolis to Chicago and used about 4,000 Southwest points for the return flight that Sunday from Chicago. My friend picked me up in Chicago on his way down to Indianapolis from Madison. All in all, my Big Ten Championship weekend cost me less than $100. Tickets for a game like this can easily cost over $100 per person. Tickets in a suite (with the VIP hospitality ticket) are obviously worth much more than that, probably $1,000 per person or more. But because I had previously refinanced my student loans with SoFi, I was able to go to the game and the pre-game VIP area completely for free! It’s access to events like these that I think differentiates SoFi from a lot of other student loan refinancing companies. Most people, even people who are already SoFi customers, don’t know about these perks. They should though because these events give you a great chance to get a bunch of free stuff and experience things that you otherwise might not get to do. 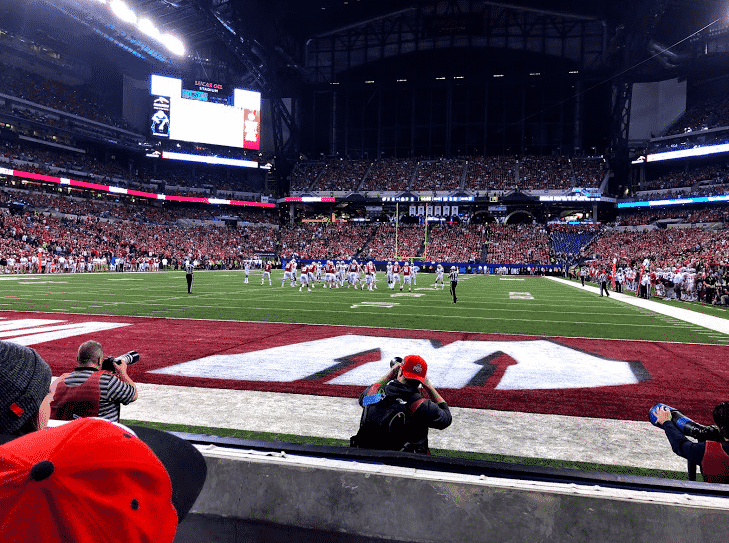 My view from the SoFi suite at the Big Ten Championship – definitely worth the zero dollars we paid. Indeed, over the past 2.5 years, I’ve received literally thousands of dollars worth of free food, drinks, and travel from SoFi – all because I refinanced my student loans with SoFi over two years ago. If you have student loans and are thinking about refinancing them, these SoFi events are something that you can (and should) take advantage of too. There’s no shortage of student loan refinancing companies that you can use – tons of new companies have popped up over the years. When I refinanced my student loans back in 2015, I did it with three of the largest and most popular student loan refinancing companies out there (SoFi, CommonBond, and Earnest). 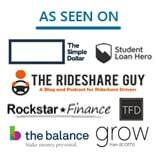 I detailed my entire experience refinancing my student loans with each of these companies in a post from last year. The truth though is that, for the most part, these companies are all pretty much the same. 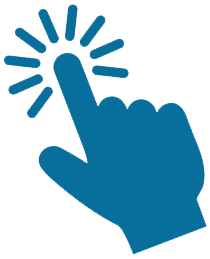 There might be some slight differences in interest rates between the companies or the types of signup bonuses that they offer, but all in all, the differences probably aren’t going to be all that much. 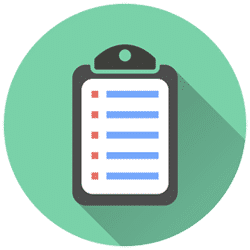 Unless you’re getting a much lower rate from one company over another, the key differences between these companies will be in the perks that they offer you. And of course, my most recent trip to Indianapolis in which I got free VIP tickets to the Big Ten Championship (check out my perfect field goal kick below). If you add it all up, that’s thousands of dollars worth of free stuff that I’ve received from SoFi (not to mention that I keep getting SoFi shirts at basically every event I attend – I probably have 5 or more SoFi shirts at this point, plus the coveted SoFi hoodie). And the great thing is that you don’t have to attend these events by yourself. SoFi allows you to bring a guest with you to every event so you’re never forced to ride solo. 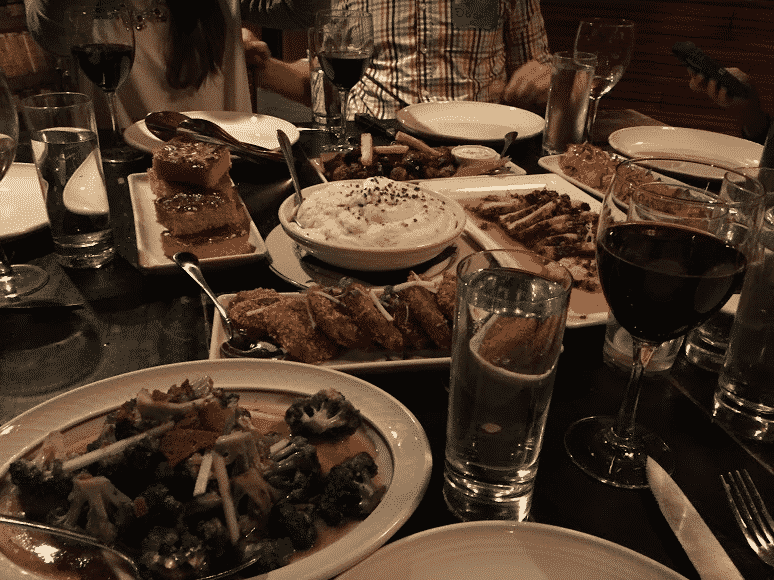 The food at a SoFi dinner I attended last year (or maybe two years ago). The dinners and happy hours are offered in major cities throughout the US, so if you live in a big city, you can expect to see a SoFi event in your area at least once per quarter (here in Minneapolis, we get a SoFi event about 4 to 6 times per year). 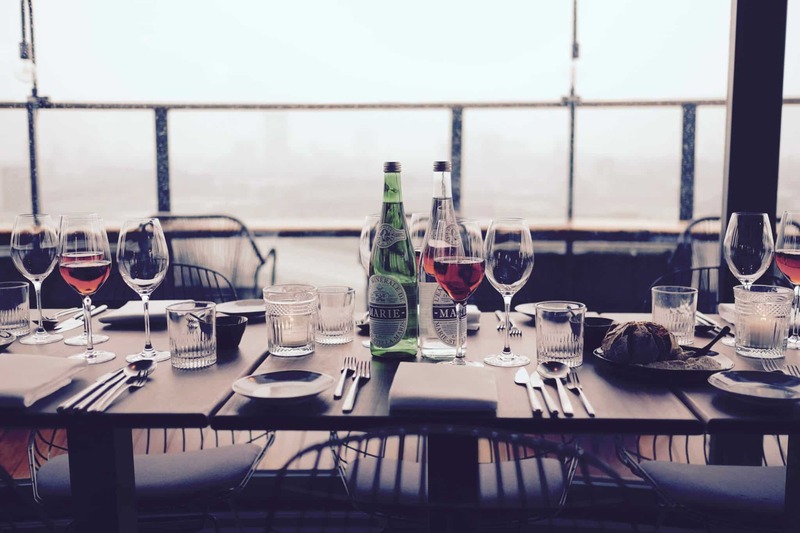 Take advantage of these events to get yourself a night out at a fancy restaurant on SoFi’s dime. I’m not the only blogger that has learned about this side benefit with refinancing student loans with SoFi. My friend Krystel over at All She Saves refinanced her student loans with SoFi and has also been taking advantage of these events. In fact, there’s a SoFi event coming up this month at a fancy restaurant in our city and she recently asked me whether I was going to be there. Of course, I was – I was the first person to sign up for the event! It’s important to note that none of the events I’ve attended have anything to do with me being a blogger. In fact, I’ve never talked about these events to anyone at SoFi (they don’t know about this blog, I don’t think) and my ability to go to these events are the same as anyone else who is a current or former SoFi member. One of the more interesting things about these events is that you can still go to them even when you no longer have a loan with SoFi. I paid off all of my student loans back in 2016, and I actually paid off my SoFi loan back in 2015. Despite not having an active SoFi loan for over 2 years, I’m still allowed (and even encouraged) to attend every SoFi event. In other words, for pretty much anyone who is thinking about refinancing their student loans, refinancing with SoFi should be one of their top considerations. Remember, you can refinance your student loans as many times as you want (I refinanced my student loans 3 times with 3 different companies). My advice: refinance your student loans at least once with SoFi. Just get yourself to be a SoFi member. If you have a good income and a good credit score, you’ll probably get a great interest rate anyway, and even if you think that you can get a better rate somewhere else, you can do that later. It’s basically a win-win to start your refinancing journey with SoFi – you’ll get a lower rate than what you’re already paying and you get to go to all of these free SoFi events. If you refinance your student loans using my link, you’ll also get a $100 signup bonus. Not bad to get paid, lower your student loan interest rate, and get all of this free stuff too. Will these SoFi events keep going for the long term? Who knows? SoFi keeps getting bigger – it’s possible they won’t be able to sustain all of these community events forever. But I’ve always said to take advantage of this kind of stuff while you can. I’ve gotten thousands of dollars worth of free stuff from SoFi, eaten at cool restaurants that I otherwise wouldn’t be able to afford to go to, and had experiences that I won’t forget. You can do the same too. Are any other SoFi members out there taking advantage of all these free events? Are there any other student loan refinancing companies that are doing cool things like this? What a trip! Congrats on this. I wish I had student loans.. I’d definitely use your link! I’ve had a few debt-free people say the same thing when they hear about all these events I go to! Hopefully these good times keep rolling! Thanks Kyrstel! I’ll see you there! I checked the menu for the restaurant and it’s normally over $100 per person for the four-course menu and a drink pairing. So, I think we’re getting our money’s worth! You know Krystel! Small world. While I’m fortunate to have no student debt – I’m introducing Sofi to my little sister who does (private school, amirite?). Anxious to see how it pans out for her! I am jealous!! That is awesome, FP!! Good work. Thanks man! It’s a perk that a lot of folks should take advantage of. Excellent finds here – makes me wonder what other “freebies” are out there for the taking if we just look a little harder. Haha, I’m really hoping that they have that Big Ten Championship event again next year. 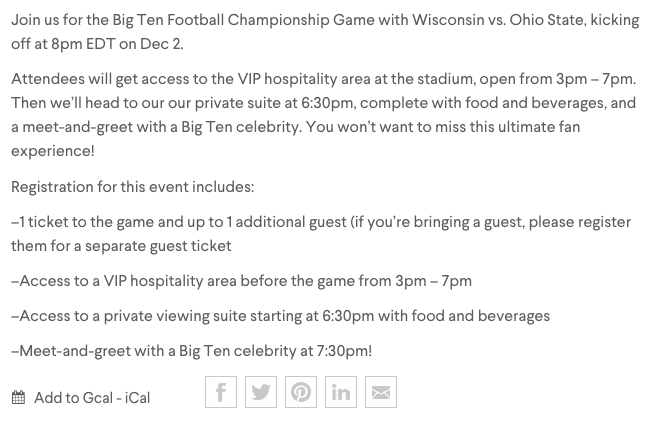 SoFi is a sponsor for the Big Ten, so I bet they get the same suite every year. Holy crap! After reading this post, I almost wish I had student loan debt. Glad you had a terrific time at the championship, my friend. Cheers. Thanks Mr. Groovy! You’re not the first person who’s said that to me haha. Probably better not to have the student loan debt, but at least I got a little something back for it. I have definitely heard of them and knew people really liked them. But this post gave me way more of an inside look. Glad they’re treating you well! It’s an easy way to get something back for something you’re already doing anyway. The student loan refinancing companies are all pretty similar. If you’re getting a similar rate all around, might as well get that free stuff too! What a great perk and awesome seats! Too bad Wisconsin didn’t win though. I went to Northwestern, so hoping I get to go the the Big Ten Championship soon to see my Wildcats play there. By the way, who was the Big Ten celebrity at the meet and greet? Yeah, it was a bummer we couldn’t pull it off! The big ten celebrity was Ron Dayne – I bet you could have guessed that. I think that’s basically how he makes money now. Great that they have awesome events as part of the perks. I just snagged $500 for refinancing my student loans a little over a year ago but I think I’ll be refinancing again with your link. Why not right? It’s wonderful that there are so many more options to refinance nowadays.